If you are in a line of work where you receive reviews about it, like I do running a coworking space and writing books, you understand the importance of reviews and feedback from your clients. True positive reviews are great (even the dreadful perfect four star review): they motivate you and your team and also help you with the marketing. Negative ones can help you improve your space if they are constructive and detailed, and the nasty ones can hurt morale a lot. The best review and feedback I’ve ever received about The Coworking Handbook came from Fabio Gatts, the founder of a coworking space in Rio de Janeiro. Which is the best review ever? Every single review is welcome, but when somebody like Fabio gets to work hard and translates the book because he thinks it is so good it needs to be in Portuguese it is the best review ever. What could be more positive? 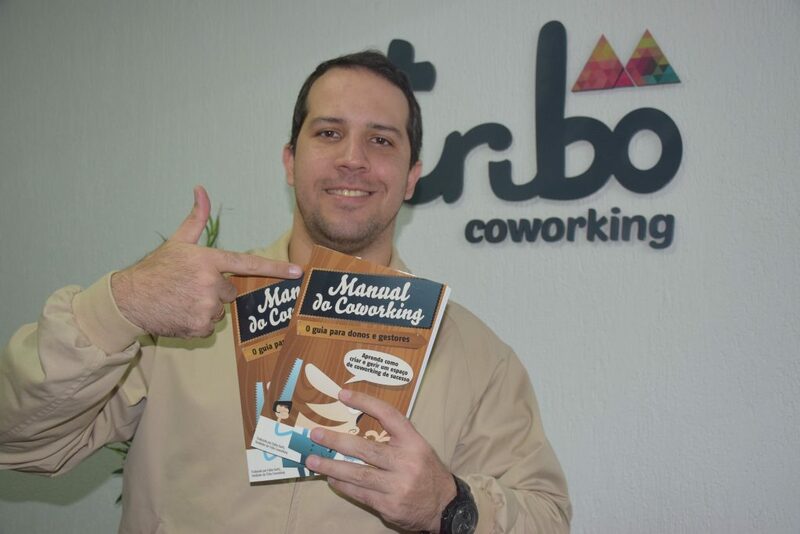 In the emails that followed and the conversations we had he made it clear: the book had helped him to run his coworking space and he thought it had to exist in Portuguese to be used by other coworking entrepreneurs to set up and run their espaces. Isn’t this the best feedback ever? To be able to better explain Fabio’s point of view, I sent him a few questions that I thought could help you understand why he decided to translate The Coworking Handbook and how it has helped him to run his coworking space. How & when did you decide to open Tribo Coworking? My partner Camila Mireilles and I decided to open Tribo Coworking in 2013, when Camila saw a lecture about shared economy and heard about coworking. We were talking about opening a business, quitting our jobs, so when we heard about it, we decided “this is it!”. Which have been the biggest challenges to open and run Tribo Coworking? We thought that it was a growing market (and it is), but we were surprised that very few people knew about it, at least in Rio de Janeiro. I believe the biggest challenge is to get people to know about it, and to show them that you don’t need an office just for you, you can share with others and still grow your business. How has The Coworking Handbook helped you in your coworking business? We discovered The Coworking Handbook when we were already creating our space. It helped us to organize how things would work, understand that the community is the center of a coworking space, learn about marketing and about having a minimun size for the space to be interesting for the clientes, learn about finances, etc. With the book, we had an idea about how a good space should be. What is the part of The Coworking Handbook that had the biggest impact in your coworking business? It was 3 parts: community, marketing strategy and finances. These chapters in the handbook gave us a direction to follow. Why did you decide to translate The Coworking Handbook? First of all, there were no books in brazilian portuguese. All the books were in english. O Manual do Coworking is the first one, and I believe it’s important to have references in this industry. Also, the coworking industry is growing in Brazil. When we opened, we received some people asking for tips to open a coworking space. When I heard some of the ideas, I knew they wouldn’t work (for example, people thinking about opening a space with R$ 10,000). So I started to think about that, if they opened a space like this, people wouldn’t like it, they would be broken and the coworking concept would be badly judged. So, I decided to talk to Ramon and translate the book, to help them build a good space. What’s next for Fabio and Tribo Coworking? We want to be a reference for coworking spaces in Rio de Janeiro for locals (cariocas) and foreigners (we are coworking in Copacabana, and we receive many foreigners from all over the world), grow in size and reach, and help as many entrepreneurs and small companies as we can. Then, write up a true positive review of O Manual do Coworking and recommend it to your friends and colleagues that will benefit from reading it (for links to the different stores click here). Do you want to translate The Coworking Handbook to your language?